Up to 60% of women will experience a hair growth disruption, some even at a young age. YOU ARE NOT ALONE! 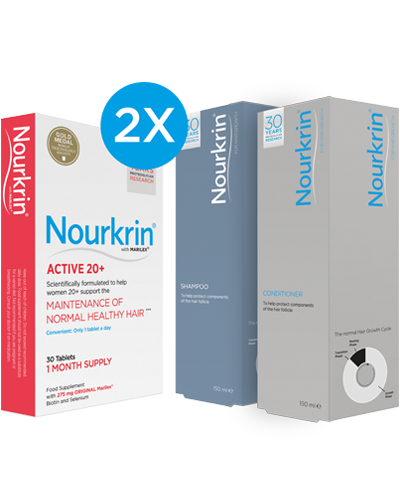 Nourkrin® Active 20+ is for all women in their twenties and thirties, who want to maintain the normal growth and health of their hair despite a busy lifestyle. My hairdresser commented last week that my hair was looking thicker, I said I hadn’t dare say as much myself, but I also felt the same. I have used so many lotions and potions with no result. Thank you so much for Nourkrin® tablets and lotion, I will carry on using these in the future. 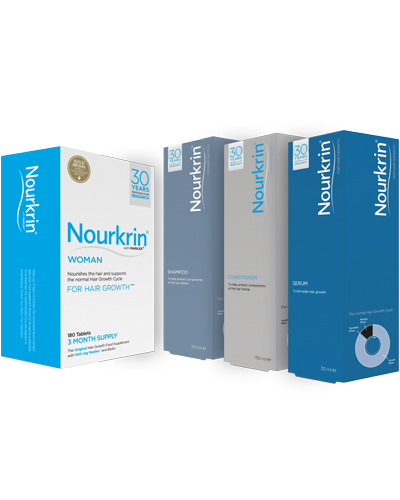 Following the programme with Nourkrin® Woman for Hair Growth, or if the first signs of thinning are witnessed at an early age, it is advisable that Nourkrin® Active 20+ is started as soon as possible and continued as a maintenance programme until you are content with the quality and texture of your hair. Nourkrin® Active 20+ is completely safe and 100% drug-free. Marilex® (fractionated fish extract with specific lectican proteoglycans), L-selenomethionine, D-biotin, bulking agents (microcrystalline cellulose; calcium hydrogen phosphate), stabilisers (hydroxypropyl methyl cellulose; talc; glycerol), glazing agents (magnesium salts of fatty acids), colours (titanium dioxide). Subscribe to our newsletter to stay up to date on the newest research within the field of hair growth disorders and female hair loss, information about upcoming events and competitions with Nourkrin® Active 20+.